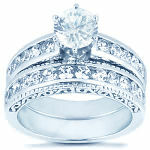 We design and manufacture in-house, extensive collection of diamond engagement rings and fine jewelry. We can custom set your diamond choice to your exact specifications. Most of the time we can complete the job in less than five business days.